After a wonderful lunch and small talk at the lunch buffet, we had two more sessions at the EYC unConference today. You can read part 1 and part 2 before continuing if you haven’t already done so. 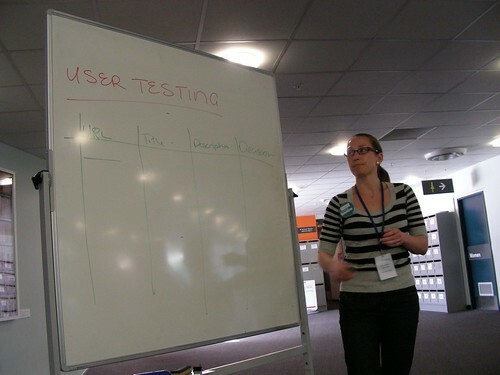 Courtney Johnston offered to facilitate a session on user testing and how to do that on a shoe-string budget. A lot of user testing can be done by using paper and web site mockups. You also do not need hundreds of users, but can often already get an idea when you ask about 6 people to participate in a card-sorting activity or give them a task to complete on a web site. Some professional usability testers may bury their head in the sand when they read these lines, but here were are talking about testing web site for communities that operate on a very low till non-existent budget who cannot afford to have sessions in a usability lab and use awesome, but expensive software and setups to conduct their testing. Often, even only with a few number of people, you can get an idea of whether a certain navigation works, whether menu items are named logically etc. However, when you only have access to a small number of people, you should be acutely aware of their ICT background to interpret their answers correctly and not make false assumptions and objectifying these. Tim McNamara offered the last session that I went to for this day of learning more about community involvement online. It was on how to give useful feedback to software developers. That was a dear topic to me as I get frustrated sometimes when people write forum entries or send me emails from which I cannot really make out the problem and try to solve it. It always takes a lot of effort to figure out what the issue might be and how to solve it. What browser (or hg/svn client) are you using? On what operating system? I will have to check if we could also add such pre-populated text in Launchpad for people filing Mahara bugs. That would be very useful. A big Thank You to the organizers and volunteers as well as the participants of the unConference who made that day a great learning experience.